The global economy experienced its sharpest contraction since Second World War in the first half of 2009 before countries started to gradually emerge from recession in the second half of the year though recovery has been uneven. Countries accounting for more than 60% of world economic output were mired in an unprecedented synchronised recession with the 2008 global financial crisis, exacting its toll on the real economy in the first quarter of 2009 that resulted in significant contractions in real GDP. Many countries have resorted to dishing out large financial and economic stimulus packages to bolster liquidity and spur domestic consumption to support their battered national economies. The Malaysian economy experienced the full impact of the global recession in the first quarter of 2009 where real GDP contracted by 6.2% and ended the year with a 1.7% contraction. Given the high degree of openness of the Malaysian economy, the collapse of global demand and world trade led to double digit declines in Malaysia's exports and industrial production. As a result, total trade for the country in 2009 decreased by 16.6% year-on-year, with both exports and imports registering a drop of 16.6%. Malaysia recorded total export earnings of RM553.3 billion in 2009, of which the timber sector contributed RM19.49 billion or 3.5% (cf. 3.4% in 2008). Due to deterioration in global demand owing to the collapse in world trade, export earnings by the Malaysian timber sector in 2009 took a beating by recording a drop of 14.5% year-on-year, the first fall since 2006. Notwithstanding, the timber sector remained the fifth largest export earner for the country for the second consecutive year after electrical and electronic products, palm oil and palm oil-based products, liquefied natural gas and crude petroleum. Export earnings of RM19.49 billion in 2009 by the Malaysian timber sector were contributed by revenues from the export of Wooden Furniture (32%), Plywood (25.6%), Sawntimber (12%), Logs (10.4%), MDF (5.3%), BCJ (5.1%), Mouldings (3.5%), Other Timber Products (3.2%), Veneer (1.6%) and Particleboard (1.3%). The year 2009 has been a tumultuous year for the Malaysian timber sector which registered a drop in export earnings for all the sub-sectors. The biggest falls in value terms were recorded by secondary products such as Plywood (from RM6.33 billion to RM4.99 billion, a drop of 21.2%) and primary products such as Sawntimber (from RM3.08 billion to RM2.34 billion, a drop of 23.8%) respectively. Other secondary products such as Medium Density Fibreboard (MDF) and Veneer also registered declines in export revenue by 10.6% and 29.3% respectively whereas primary product like Logs experienced a slight drop of 1.7%. The declines were largely attributed to falling prices and drastic curtailment in consumption by the building and construction industry, builders' carpentry & joinery sector and furniture manufacturing industry in major markets aboard. In contrast, value-added finished products such as Wooden Furniture, Mouldings and Builders' Carpentry & Joinery appeared to have performed better in export earnings under difficult global market conditions of 2009 with only single-digit declines of 9.7%, 7.7% and 1.7% respectively. The National Timber Policy (NATIP) has set a target of a 60:40 export ratio of value-added tertiary products versus primary and secondary products by 2020. The export ratio of 44:56 value-added tertiary products versus primary and secondary products was attained in 2009 as compared to 41:59 in 2008. By region of export destinations in 2009, Asia accounted for 61.5% of total export revenues followed by the Americas at 15.2%, European Union (EU) at 13.9%, Oceania/Pacific at 4.5%, Africa at 3.9%, Europe-Others at 0.9% and Other Countries (NES) at 0.1%. With the exception of an increase of 80.7% in exports to Other Countries (NES) valued at RM12.2 million, Malaysia's timber exports to all other regions recorded declines in 2009. Notable year-on-year falls were recorded in exports to Asia (-14.5%), EU (-21.4%), Americas (-8.2%), Oceania/Pacific (-11.3%), Africa (-8.8%) and Europe-Others (-32.8%). The pattern of export by the Malaysian timber trade to these geographical regions reflects the varying degrees of impact of the global downturn on economies of importing countries located in these respective regions. For Asia, South Asia was the only region to chalk up a 4.3% increase in import from Malaysia year-on-year, mainly buoyed by India's demand in its rush to complete buildings and infrastructure in time for the 19th Commonwealth Games in New Delhi in October 2010. By country of export destinations, Japan and USA retained their positions as the leading buyers at 19% (or RM3.7 billion) and 12% (or RM2.34 billion) respectively of Malaysia's total export of timber products in 2009. Notwithstanding, Malaysia's export to Japan and USA fell by 22.9% and 10% year-on-year respectively in 2009, mirroring these two countries' market situation which was mired in deep economic recession. On a brighter note, both India and South Korea, the third and fourth largest export markets for Malaysian timber products in 2009 respectively, recorded increases of 13.7% and 7.3% year-on-year in imports from Malaysia. India registered a slower GDP growth of 6.5% for the year (cf. 7.4% in 2008) while South Korea narrowly avoided a recession with a paltry 0.2% GDP growth (cf. 2.2% in 2008). Among the major timber products exported by Malaysia in 2009, export receipts from log experienced the smallest drop of 1.7% year-on-year to RM2 billion on the back of 4.2 million m3 of logs. In value terms, log exports contributed 10.4% to total export earnings from timber products which made it the fourth largest export item for the country's timber trade. India continued to be the largest export market for Malaysian logs in 2009 by registering a 25.2% growth over 2008 to RM1.1 billion with a volume of 2.2 million m3. 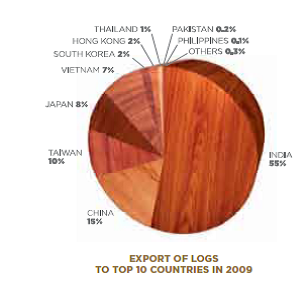 Other major importers of Malaysian logs in 2009 were China (RM308.8 million or 15.3% of log exports), Taiwan (RM198.9 million or 9.8%) and Japan (RM170.8 million or 8.4%). Imported logs were used to feed India's sawmills and secondary processing plants to produce sawntimber and panel products (plywood and particleboard) for its domestic carpentry, joinery and furniture-making industries to meet the growing needs of its large population. Meanwhile, Malaysia's traditional log export markets like China, Taiwan and Japan recorded double-digit falls of -16.6%, -19.9% and -45% respectively over the previous year, which was attributed to the slowdown in China's economy and severe recession hitting Taiwan and Japan. Aside from being inflicted by decreased demand and a slump in new housing starts, Japan has increasingly switched to using its own domestic log species in sawmills and plywood production. In 2009, the shares of domestic logs for lumber and plywood in Japan have risen to 69% (cf. 65.3% in 2008) and 64.8% (cf. 52.3% in 2008) respectively. Besides India, bucking the downward trend were Vietnam and South Korea where both countries recorded an increase of 1.2% and 1.3% in the value of logs imported from Malaysia in 2009. Vietnam and South Korea imported logs worth RM135.6 million and RM34.1 million respectively from Malaysia, accounting for market shares of 6.7% and 1.7% in 2009. In recent years, Vietnam has resorted to importing logs and timber to fuel its growing wood-based industry which is increasingly export-oriented. South Korea which narrowly escaped experiencing a technical recession in 2009 continued to import logs for downstream processing activities of its wood-based industry. For 2009, export of sawntimber worth RM2.3 billion with a volume of 1.9 million m3 contributed 12% to Malaysia's total export value of timber products thus making it the third largest export earner. Notwithstanding, revenues from the country's sawntimber exports in 2009 plummeted 23.8% year-on-year due to a drastic fall in demand from its key markets. Thailand remained the largest market for Malaysia's sawntimber in 2009, garnering a market share of 16.8% valued at RM394.4 billion but registered a 19.4% dip in export earnings compared to 2008. The internal political problems in Thailand coupled with collapse of world trade that resulted in a sudden plunge in demand from advanced economies have adversely impacted on the Thai economy that relied on its export-related sectors. Thailand suffered a contraction of 2.3% in real GDP in 2009 compared with a growth of 2.5% the year before. The bulk of sawntimber with a volume of 459,973 m3 exported to Thailand comprised lower value timber of mainly merchantable grade. The Netherlands, the second largest export market for Malaysian sawntimber with a market share of 10.9%, recorded a drop of 38.1% to RM255 million in 2009 (cf. RM412 million in 2008). Sharp decline in private consumption, falling house prices and deteriorating employment prospects resulted in businesses cutting production sharply. These factors, coupled with drawn-down inventories to abnormally low levels amid weak demand and tight credit conditions, have indeed adversely impacted The Netherlands' timber trade. 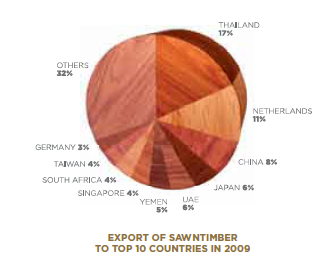 Germany, the tenth largest export destination for Malaysian sawntimber in 2009 with a market share of 3.2%, also suffered from economic malaise engulfing the Euro Zone. Germany imported RM74.8 million worth of Malaysian sawntimber, a decrease of 27.1% compared with 2008. In 2009, The Netherlands and Germany imported 94,241 m3 (cf. 138,058 m3 in 2008) and 29,763 m3 (cf. 39,773 m3 in 2008) of sawntimber from Malaysia. Malaysia's sawntimber export to traditional markets in the Far East like Japan, Taiwan and China experienced decreases of 38.6%, 40.1% and 4.6% in value terms to RM137.6 million, RM183.5 million and RM92.6 million respectively. Japan was mired in the longest post-war recession and downturn in building construction activities. Additionally, falling housing starts brought about a lack of demand for timber and wood-based products. Likewise, the economic situation in Taiwan was somewhat similar to Japan since the economies of both countries were badly affected by the plunge in demand for their exports owing to the collapse in world trade. In contrast, China's economy was cushioned by the Government's exceptionally large economic stimulus package of US$585 billion to spur domestic consumption to offset the fall in exports. In recent years, China has resorted to importing more logs to meet its domestic timber requirements and to fuel export-oriented joinery (i.e., door & flooring) and furniture factories. Despite the spectacular collapse of the property sector in Dubai that had wide ranging ramifications on its building and construction industry, UAE has managed to remain as the fifth largest export market for Malaysian sawntimber in 2009 with export receipts amounting to RM131.9 million, down by 35.2% year-on-year. Dubai is the import and re-export hub for the Middle East where Malaysian timber products are distributed to neighbouring countries in the Gulf, North and East Africa. Going against the downward trend, Yemen recorded a 39.1% jump in import of Malaysian sawntimber to RM117.8 million in 2009, garnering a market share of 5.6%. In 2009, UAE and Yemen imported 116,896 m3 (cf. 181,822 m3 in 2008) and 112,646 m3 (cf. 81,831 m3 in 2008) respectively. Plywood, with an export volume of 3.8 million m3 valued at RM5 billion, remained the second largest export earner, accounting for 25.6% of Malaysia's total export receipts for timber products in 2009. The global economic downturn that affected building and construction activities of its major markets also saw Malaysian plywood export volume and receipts dropped by 16.8% and 21.2% respectively in 2009 compared with the previous year. Japan, which accounted for 40.5% of Malaysia's plywood exports earnings in 2009, continued to be the largest buyer despite importing 16.8% less in volume compared to 2008. In 2009, Japan imported 1.5 million m3 (cf. 2 million m3 in 2008) of Malaysian plywood worth RM2 billion (cf. RM2.9 billion in 2008). 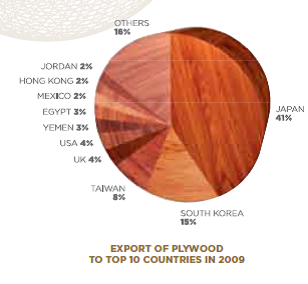 For 2009, Malaysian plywood accounted for 53.3% of Japan's total imported plywood. Hit by the longest recession since World War II, the export-reliant Japanese economy suffered the biggest fall in new housing starts to the new low of 788,410 units in 2009, the first time in 45 years to have fallen under 800,000 units per annum. South Korea, accounting for 15.4% of Malaysia's total plywood export revenues in 2009 was the second biggest plywood market, with imports of 698,580 m3 (cf. 606,431 m3 in 2008) valued at RM769.2 million (cf. 697.5 million in 2008). Despite Korea's economic slowdown, import value of plywood from Malaysia went up in 2009 by 10.3% over the previous year. A supplementary budget along with a US$660-million stimulus package in special loans for private firms involved in the construction of new highways, roads and bridges helped to keep its economy afloat. Malaysia has been the leading supplier of plywood to South Korea for the past 5 years. Plywood less than 6mm thick was imported by South Korea to cater for its domestic requirements since its mills produced only plywood with thickness above 6mm. In 2009, Malaysia's export of plywood to the UK fell by a whopping 45.8% in volume to 132,329 m3 and 50.3% in value to RM183.4 million. The UK, despite being badly hit by recession and the credit crunch, still accounted for 3.8% of Malaysia's total plywood export receipts in 2009, and was the fifth largest buyer of Malaysian plywood. Malaysia's plywood exports to Yemen and Jordan in 2009 recorded positive growth in revenues of 75.3% and 15.6% respectively year-on-year. Yemen, the sixth largest export destination for Malaysian plywood, bought 123,408 m3 valued at RM152.3 million in 2009 to cater for its housing and social development projects and construction of infrastructure. Jordan, ranked tenth for Malaysian plywood exports in 2009, imported 88,436 m3 valued at RM114.2 million mainly for reconstruction in Iraq. Jordan acts as a conduit for Malaysian timber products entry into the war-torn Iraqi market. Ranked seventh biggest buyer of Malaysian plywood in value terms in 2009, Egypt imported 125,046 m3 worth RM150.4 million, a decrease of 5.9% and 10.4% respectively. The drop in exports to Egypt was attributed to the adverse impact of global economic downturn on its large domestic export-oriented furniture industry, a major consumer of plywood. Medium Density Fibreboard (MDF), the fifth largest revenue earner, contributed 5.3% to Malaysia's receipts from export of timber products in 2009. For the same year, Malaysia exported 1 million m3 (cf. 1.1 million3 in 2008) of MDF worth RM1 billion (cf. RM1.1 billion in 2008), a drop of 8.8% in volume and 10.6% in value compared to 2008. Japan was the largest importer of Malaysian MDF in 2009 with 137,768 m3 (cf. 160,396 m3 in 2008) valued at RM200.7 million (cf. 215.2 million in 2008), accounting for 19.4% of Malaysia's total MDF exports. Given the recessionary conditions affecting consumption by construction and allied industries, Malaysia's MDF exports to Japan dropped by 6.7% in 2009. The unprecedented building and construction boom in the Middle East particularly in the oil-rich Gulf Co-operation Council (GCC) since the end of Iraq War in May 2003 has resulted in the region emerging as the single largest regional market for Malaysian MDF exports. In 2009, UAE with a market share of 11.3% in value terms, Iran (8.6%), Syria (6.4%) and Saudi Arabia (4%) were all ranked among the top ten export destinations for Malaysian MDF. Notwithstanding, MDF exports to UAE in 2009 spiralled down by 39.1% in volume to 108,649 m3 and 38.9% in value to RM117 million. 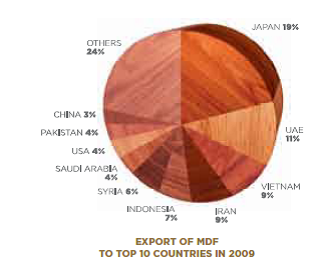 UAE was the second largest buyer of Malaysian MDF in 2009. With big state-owned developers mainly in Dubai plagued by liquidity crunch and a crisis of business confidence, the emirates' property and realty sector crashed resulting in numerous mega projects being delayed, postponed or abandoned. As a result, consumption of MDF took a nosedive with many local joinery, interior-fit out and furniture manufacturing businesses left in a lurch over payment by developers and project owners. In contrast, Iran and Syria both recorded increases in MDF imports from Malaysia in 2009 by 757.5% and 23.9% respectively. Iran imported mainly value-added melamined and painted MDF boards while Syria opted for the cheaper plain boards. Vietnam, the third largest export destination for Malaysian MDF in 2009, took in 130,481 m3 valued at RM93.8 million albeit a drop of 7.7% in volume and 15.5% in value amidst the global economic slowdown and financial crisis. In recent years, Vietnam has been importing huge quantities of wood products for downstream processing by its export-oriented wood-based and furniture industries. The export of MDF from Malaysia to China fell from 66,801 m3 in 2008 (valued at RM55.1 million) to 44,191 m3 in 2009 (valued at RM31.2 million). An over-capacity in domestic MDF production coupled with dwindling overseas orders for China's furniture, doors and flooring, the resulting fall in consumption has necessitated rationalisation in MDF imports. Total export of Mouldings by Malaysia dropped from RM686.4 million in 2009 to RM744.1 million in 2008, a decrease of 7.7%. The Netherlands remained the biggest market although Malaysia's exports have plunged by 30.8% year-on-year to RM114.5 million in 2009. Malaysia's moulding exports to Japan, the second largest export destination, fell by 29.5% to RM107.5 million for the same year. 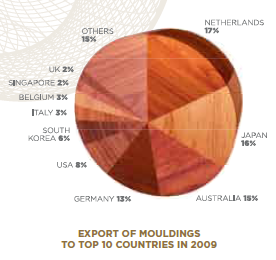 The Netherlands and Japan contributed 16.7% and 15.7% respectively to Malaysia's total moulding exports in 2009. With the exception of Germany, the other countries in the Eurozone that ranked among the top ten export destinations for Malaysian mouldings such as Italy, Belgium and the UK all recorded negative 2009/2008 growth in import from Malaysia by 2.8%, 30.5% and 13.5% respectively. With the Eurozone entrenched in recession, importers of mouldings in these countries were affected by the lack of demand from the building and housing sector. Interestingly, Australia and Germany both chalked up increases in import of Malaysian mouldings by 8% and 59.5% that amounted to RM105.2 million and RM85.3 million respectively in 2009. Australia and Germany contributed 15.3% and 12.4% respectively to Malaysia's export of mouldings in 2009. After a drop in GDP in the first quarter, Australia managed to achieve a 1.4% real GDP growth for 2009 compared to 2.2% in 2008. Asian countries like South Korea and Singapore, ranked sixth and ninth largest export destinations for Malaysian mouldings in 2009, also recorded positive growth of 50.9% and 43.4% amounting to RM38.9 million and RM16.7 million respectively. Increased uptake of mouldings such as flooring materials in South Korea was probably bolstered by the government's stimulus package to spur building activities in the housing sector. 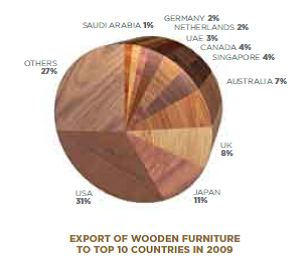 In 2009, Malaysia's export of veneer dropped to RM307.6 million, down by 29.3% compared to the previous year. Revenues from export of veneer contributed only a mere 1.6% to the total export earnings of Malaysian timber products in 2009. South Korea has overtaken Taiwan as the top export market for Malaysia's veneer in 2009 by absorbing RM108 million worth of veneer sheets, down by 17.9% compared to 2008. Taiwan and Japan, ranked second and third largest markets, imported Malaysian veneer valued at RM101 million (down by 23.2% cf. 2008) and RM32 million (down by 31.1% cf. 2008) respectively in 2009. Export of veneer by Malaysia to the three Far Eastern countries of South Korea, Taiwan and Japan contributed 35.1%, 33% and 10.4% respectively to Malaysia's total export receipts from veneer in 2009. Malaysia's export of veneer to China dropped by 47.4% to RM17.9 million due largely to the shutdown in production or closure by many of its export-oriented wood processing factories that consumed veneer. It was reported that some 30 – 50% of wood processing companies in the province of Shandong, Jiangsu and Zhejiang were closed due to the impact of the global economic slowdown. 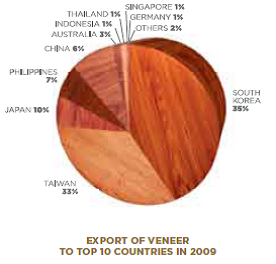 With the exception of Germany and Australia, Malaysia's top ten export destinations for veneer in 2009 were Asian countries. In a financially turbulent year for many nations, Germany was the only market to have recorded a positive growth of 28.3% year-on-year for Malaysian veneer exports. Earnings from export of Builders' Carpentry & Joinery (BCJ) by Malaysia in 2009 dropped to RM987.8 million, down by 1.7% compared to 2008. 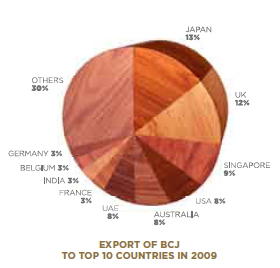 BCJ contributed 5.1% to Malaysia's total export earnings of timber products in 2009. In 2009, Japan overtook the US as the largest export market for BCJ by registering a 59.8% jump to RM132.5 million year-on-year despite faced with the deepest recession on record. Meanwhile, US slipped to fourth place with BCJ imports from Malaysia tumbling to RM78.9 million, down by 38.6% for the same year. The US was plagued by the sub-prime mortgage crisis and financial meltdown that caused widespread foreclosure of defaulted housing loans, which subsequently caused a collapse of the housing sector. Malaysia's export of BCJ to the Eurozone countries such as UK, France and Germany fell by 3.8%, 11% and 2.4% respectively in 2009 amidst the economic downturn. Going against the downward trend was Belgium which recorded a surge of 76.8% growth in BCJ imports from Malaysia to RM28.9 million. For the same year, UAE and India also experienced growth in their import of Malaysian BCJ by 83.9% and 25.8% to RM74.7 million and RM30.8 million respectively. Despite the sudden collapse of UAE's property and real estate sector, BCJ products such as flooring and doors were imported to complete building projects which had reached the interior-fit out stage. The growing affluence of the Indian middle class and increasing housing needs saw India importing more BCJ products for its active building construction sector. Wooden furniture was the largest export earner for the Malaysian timber industry in 2009, accounting for 32% of its total export receipts by netting RM6.2 billion, down by 9.7% compared to the previous year. Despite the sub-prime mortgage crisis and foreclosures as well as meltdown of its financial and banking system, the US remained Malaysia's top furniture export market in 2009 with a market share of 31% but registered a drop of 4.2% to RM1.9 billion in 2009 from a year ago. Japan, the second biggest furniture export destination with a market share of 11.4% chalked up a 17% increase in import from Malaysia valued at RM711 million in 2009. In comparison, Malaysia's main competitors like China, Thailand and Taiwan experienced significant slide in exports to Japan that was hit with deep recession. Malaysia has been gaining prominence as an attractive import destination for furniture products among Japanese importers due to improving quality over the years. The UK moved up a notch to become the third largest buyer of Malaysian furniture in 2009 with a market share of 8.1% and contributed RM509 million in export receipts, up by 17% amidst recessionary condition. In contrast, Australia slipped to fourth position and contributed 6.8% or RM428 million (down by 15% year-on-year) to total Malaysian furniture exports in 2009. With export receipts down by 50.5% from RM343.3 million (2008) to RM170 million in 2009, UAE dropped from being the fifth to the seventh largest market for Malaysia's furniture exports. This was largely attributed to the collapse of Dubai's realty sector that led to a host of economic problems such as lack of liquidity in its banking sector, loss of business confidence and closure of companies. Subsequent exodus of unemployed expatriates returning home resulted in a lack of demand for low to mid-end furniture, which was dominated by Malaysian imports in the UAE market. The significant re-export trade of furniture by Dubai to surrounding countries was also adversely affected by the global economic slowdown.